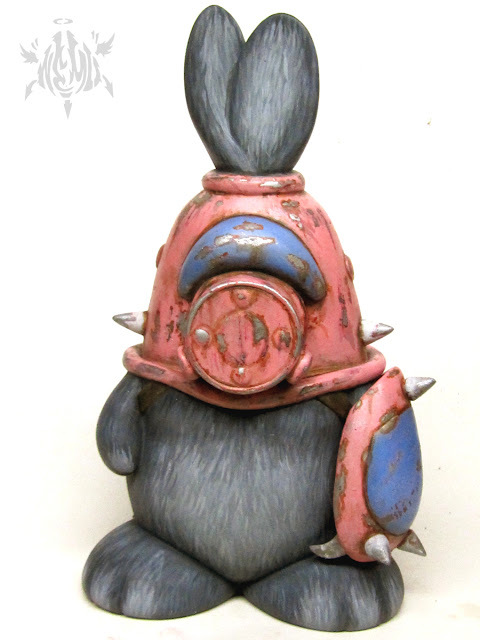 This custom Easter Haremongous will be for sale at our Toy Street table. Roll up and check out the intense rusty weathering in person! 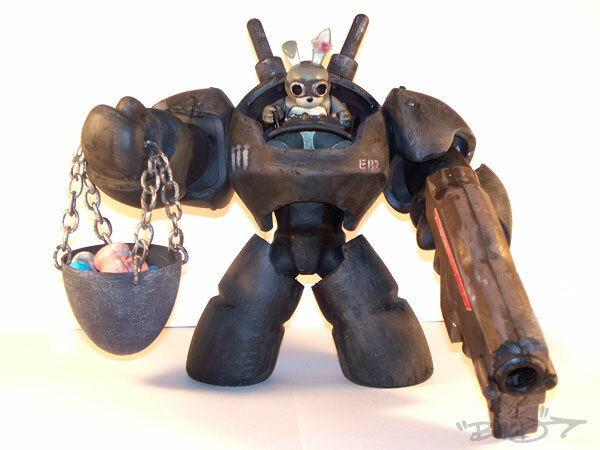 Behold the EB2 and Renegade Rabbit custom set by Bryan Lopez aka B.A.L.D. In the year 2099 all Holidays are outlawed by the RHSD (Religious Hate Speech Department) as ordered by the OWG (One World Government). All who dare to celebrate such things as Easter, Christmas etc. face death or life imprisonment, a few still rebel and follow the traditions of their forefathers. In this time the great great grandson of The Easter Bunny is one of the leading rebels in the fight against The Government. 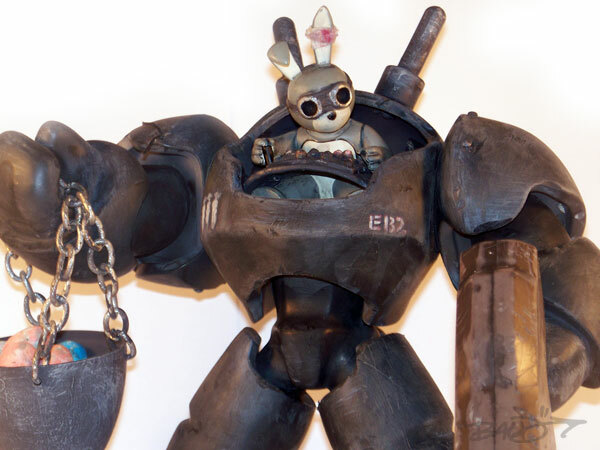 He goes by the name: Renegade Rabbit and pilots the EB2 mecha-suit. 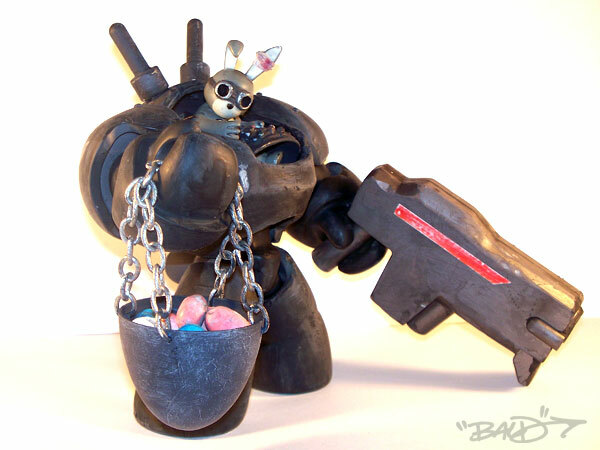 He wages war on all who would oppress the innocent and continues to deliver Easter eggs no matter the cost. More pics here. For sale 4/19/2011 @10am PST at the CTU Store here. 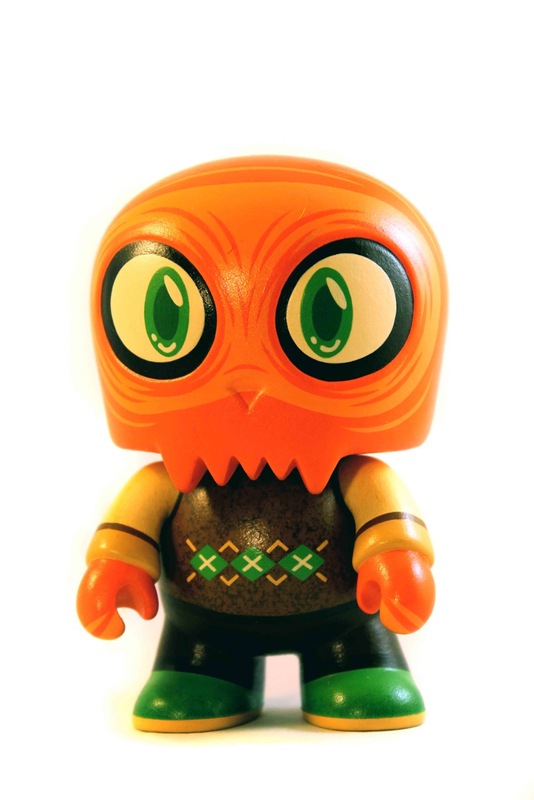 Scott Tolleson's Uncle Argh 5-inch Mini Qee is available for preorder now here. Slated to arrive in June, this production version of Tolleson's well-received "Cousin Argh" custom is priced at $28. Soon we'll also be stocking Tolleson's Otis and Otto 2-piece sets which employ a similar argyle pattern. WWRP Large Martin figures by ThreeA are finally in stock! 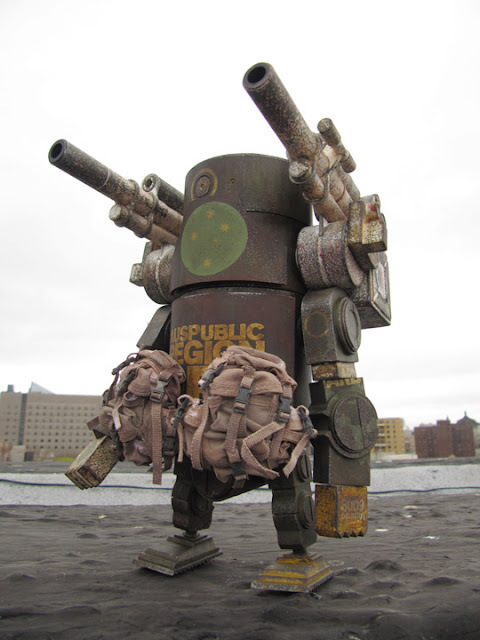 The Auspublic Region Def figure, pictured above, had significantly more detailing on the final product than we originally knew about, so I popped one open and brought it up to my roof for a photo shoot. You can buy your own 9-inch Auspublic figure here (as well as see more images from my rooftop). The rest of our 3A pieces can be purchased here.